If a heist takes you 24 hours, you’re doing it wrong. Bank-robbing’s best done in under 24 minutes – in and out before Bob Security’s looked up from his coffee. Payday, however, is all about doing it wrong – setting off all the alarms and refilling the vaults with piled-high policemen. Overkill have made the game that made their name free for a day – so that you can spend all of Thursday night playing out the best 10 minutes of Heat. Payday: The Heist will be free for 24 hours from 10am Pacific / 6pm UK time on Thursday. Overkill say we can expect “clear instructions” on how to download it on the day. The free day was initially scheduled for October 18 – but brought forward after the Payday Steam Community reached all of their stretch goals early. 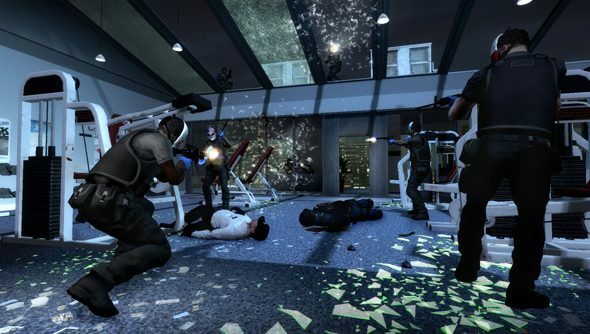 Since the summer, Overkill have been incentivising new sign-ups to their Steam page with gated rewards: unlocked Old Hoxton Breakout DLC, day/night options for certain Heists, a new GenSec enemy type. That sort of thing. Now that the community is 1,500,000 strong, they’ve reached the last, mystery reward – part of Overkill’s month-long ‘Crimefest’. “You guys have made one hell of an effort during the pasts months. Truly, we in the Overkill crew salute you,” wrote the devs. Month, month, month. Are any of you lot still playing The Heist’s excellent sequel, Payday 2?